“Our shared response may be articulated by four verbs: to welcome, to protect, to promote and to integrate. This is part of a common action that should be actively promoted by all the local Churches,” Fr Baggio said. The missionary priest this week visited Canberra and Melbourne as part of Australia’s week-long celebration of the contribution migrants have made, culminating with this weekend’s Migrant and Refugee Sunday. “The only reasonable response to the challenges of contemporary migrations is one of solidarity and mercy. These are two very important words that should always be understood when drafting and formulating policies,” he said while urging Church communities to use the 20 Twenty Action Points from the Global Compacts prepared by the Migrant and Refugee Section and approved by the Holy Father. Fr Baggio said in the 18 months since Pope Francis set up the Migrant and Refugee Section, established within the Dicastery for Promoting Integral Human Development, its major focus has been on collecting worldwide information on migrants, refugees and victims of human trafficking, understanding the causes for migration, identifying pastoral priorities and assist local Churches in developing effective pastoral actions in line with the four verbs. 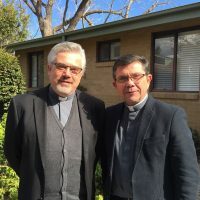 “The Migrant and Refugee Section reports directly to the Holy Father, but we collaborate with the offices of the Dicastery on many interconnected issues, like the root causes of migration – wars, disasters, climate change, persecution, extreme poverty and lack of possibilities for integral human development,” Fr Baggio said. Fr Baggio, who has held missionary roles in Latin America and the Philippines, said the Section’s achievements included increasing the global sensitivity towards refugees and migrants, particularly towards the most vulnerable ones. “It is not enough because the problems to solve are still many. This is why Pope Francis is always calling women and men of good will to do more … and there is room to do much more. The message Pope Francis has selected for the 104th World Day of Migrants and Refugees 2018 is “Welcoming, protecting, promoting and integrating migrants and refugees”. Each year, the universal Church commemorates the contribution migrants have made to local communities. The Catholic Bishops of Australia have selected the last Sunday in August each year to be the date when Masses are celebrated for the enrichment these communities have provided in the Church.